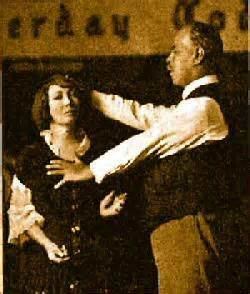 Smith Wigglesworth, an evangelist during the late 1800’s – 1942, praying for a woman. Lance Richardson’s Hearing Restored in Jesus’ Name. Many know that my husband Lance has had trouble hearing in both ears, but especially in his right ear. Because of ear infections as a child and operating heavy machinery through the years, Lance was almost deaf in his right ear and very hard of hearing in the other. Our precious friend and sister in Christ, Pamela Koefoed was ministering in our church, and after she preached a powerful message on healing, she called for those with hearing difficulty to come forward. As Pamela was saying, “The Lord wants to heal hearing today,” Lance’s ears began to pop and he left his seat and headed for the front. Pamela placed her hands on Lance’s ears and began to pray. The look on his face was priceless. As he turned around, big smile, hands clutching the side of his head and eyes wide, Lance announced that he could hear! We continue to give God praise for Lance’s healing and that He loves us so much and desires us to be physically whole. Isn’t God wonderful!?! This entry was posted in Uncategorized and tagged Christian Blog, deaf man healed, deafness healed, healing prayer, hearing loss healed, Holy Spirit, Jesus Christ, Jesus Heals, Miracles, Pamela Koefoed, Signs and wonders, smith wigglesworth. Bookmark the permalink.